Rio Band and Rio Band Alums are Having a Banner Year! 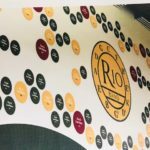 So much good news for Rio Band and Rio Band Alums! Rio’s AM Jazz Ensemble has been selected for the Essentially Ellington Festival! This “Super Bowl of High School Jazz” is run by Wynton Marsalis and will be held in May at NYC’s Lincoln Center. It features the top 15 Jazz bands in the US and Canada. This is the 9th time Rio has been selected for this festival.Congratulations to Connor Ettinger, Catherine Treadwell, Arthur Eriksson, Matthew Taylor, Hayden Powell, Grady Flamm, Grace Eastlick, Logan Duffy, Abby Telander, Anna Flaningam, Claire Parker, Grayson Cliff, Luke Roberto, Dale McMorris, Jackson Irvine, Toby Keys, Jake Nalangan, Sam Flores, Michael Gilbert, Maddy Hill, Carson Grimes and Joseph Bly. Rio’s Mingus Group- “Children Hearing Music – had a great experience at the Charles Mingus Festival held at the New School in New York City. The group wowed the judges and came away with Spirit of Mingus award. This award is bestowed on the group that best exemplifies the spirit, musicianship and commitment of the great Jazz bassist and composer, Charles Mingus. Congratulations to all! Rio’s PM Jazz Ensemble has been selected for the Swing Central Festival in Savannah, Georgia! Swing Central Jazz is a three-day workshop and competition with a collective approach to big band jazz instruction. Led by pianist/composer/educator Marcus Roberts, the clinician team includes a wide range of jazz educators such as Jason Marsalis, Jim Ketch (Associate Director), Brianna Thomas and Wycliffe Gordon. Congratulations to the whole PM band! Former Rio student, John Daversa won three Grammy Awards on Sunday! Rio Band Alum Jacob Swedlow has been selected as a charter member of Oberlin Conservatory’s “Sonny Rollins Ensemble,”created through an endowment directly from the legendary saxophonist. The group is having a great run including two sold out shows in January at Dizzys Coca Cola Club at Jazz at Lincoln Center. AM Jazz Ensemble- Chosen as Sweepstakes Winner: the top band at the entire festival! One of the other bands in the finals along with AM was Maria Carillo HS, directed by Rio Band alum Matt Bringedahl. Combo 2 (PM Trio)- 1st place in their division, and the highest score of all combos at the festival. 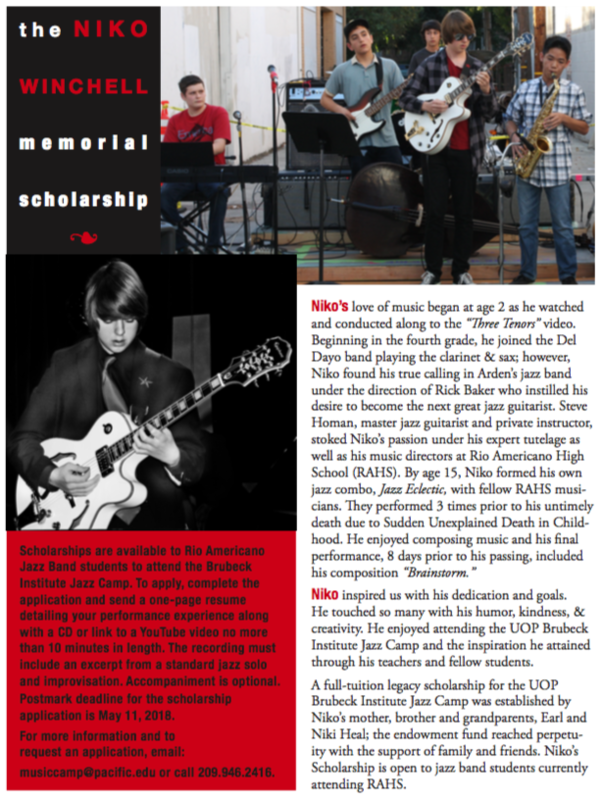 Also- Rio’s Michael Gilbert was awarded a summer jazz camp scholarship for his outstanding bass playing! Congratulations to all our Band Students! All the Latest News for January! Congratulations to our “Mingus” Combo! Our 38th annual Playathon was another huge success. Fantastic music and good community vibes contributed to a wonderful event. A huge thank you to Anna Chriss and James Treadwell, our student and parent chairs, respectively as well as EVERY student and parent who had a hand in the organization, planning and implementation of this tremendous undertaking. The cooperation and dedication of our band community is what truly sets us apart. We raised nearly $30,000 for the band program, thanks to pledge parties and the generous donations of our families and the community. Way to go Rio!